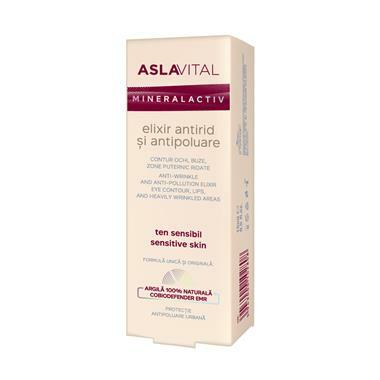 ASLMA-152 | Size: 15 ml / 0.51 fl. oz. The addition of natural clay and Cobiodefender EMR offers an efficient shield against environmental damage. Apply after cleansing, morning and evening, on the wrinkle-prone areas. INGREDIENTS: AQUA, PENTYLENE GLYCOL, GLYCERIN, HYDROXYETHYL ACRYLATE / SODIUM ACRYLOYLDIMETHYL TAURATE COPOLYMER, ETHOXYDIGLYCOL, UNDECANE, ISOHEXADECANE, SQUALANE, TOCOPHERYL ACETATE, PHENOXYETHANOL, DIMETHICONE, TRIDECANE, POLYSORBATE 60, FERULIC ACID, TETRASODIUM EDTA, DIMETHICONE CROSSPOLYMER, SQUALANE, TOCOPHEROL, SORBITAN ISOSTEARATE, PEG-40 HYDROGENATED CASTOR OIL, PARFUM, GLUCOSYL CERAMIDE, HYDROGENATED PALM GLYCERIDES CITRATE, GLYCINE SOJA OIL, DECYLENE GLYCOL, CAPRYLYL GLYCOL, MAGNESIUM ALUMINUM SILICATE, GLYCOGEN, ORYZA SATIVA BRAN OIL, SODIUM HYALURONATE, SODIUM HYDROXIDE.